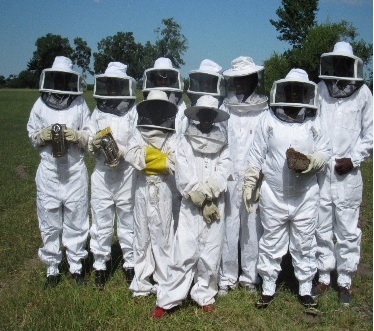 Wilderness Safaris non-profit partner, Children in the Wilderness (CITW), in partnership with Botswana’s Ministry of Agriculture, has begun training communities in beekeeping, providing them with the necessary skills to start their own honey and beeswax production businesses. This initiative, which will create a new environmentally friendly, sustainable source of income and food, forms part of CITW’s Adult Eco-Club programme aimed at diversifying livelihoods amongst rural communities. The beekeeping training took place at Beetsha Village in Botswana and was attended by 20 people, including 15 CITW Adult Eco-Club members from Beetsha and Gunotsoga Villages. The facilitator and the Ministry of Agriculture’s Beekeeping Coordinator, Mr Ntsie, covered a number of topics ranging from materials required through to some of the finer details like apiary placement, harvesting and pest control. The participants also took part in a practical exercise to capture bees for their own projects. “This programme has the ability to dramatically change the lives of Adult Eco-Club participants, who are putting their newly acquired knowledge into practice and bringing in essential income for their households”, said Mary Hastag, CITW Botswana Programme Coordinator and Community Development Liaison. Dr Sue Snyman, CITW Regional Programme Director, added that aside from the obvious financial impact, this programme has also had a profound psychological impact on members too, as a result of the renewed self-respect that they now have from being able to work and make a meaningful contribution to their family. CITW launched the Adult Eco-Club concept in Botswana in 2013 in a bid to include parents in the process of promoting environmental education and providing their children with the support they needed as they learned more about conservation through children’s Eco-Clubs and CITW camps. Adults are empowered through livelihood diversification projects, including the sale of beadwork, tapestry, weaving and leather products, and now honey, and are provided with financial, marketing and business guidance on an ongoing basis. Since the pilot project, the programme has grown significantly, with active Adult Eco-Clubs in Botswana, Malawi and Zimbabwe with 100 members in total. “We believe in sustainable conservation through leadership development and this means working with both children and parents to ensure that everyone is unified in their efforts to conserve their heritage, all the while making a long-lasting difference in terms of poverty reduction and improving social welfare,” concludes Snyman.